Everybody is familiar with high-definition video these days, which packs more visual information (more pixels) into the shows you see on TV and on Blu-ray discs. But you may not know much about high-resolution audio, which offers music in formats with clarity and fidelity that can be superior to that of CDs. I took a look at the current offerings, and how you can play these high-resolution files on a Mac. Here’s what you need to know. For starters, let’s look at what makes a file “high-resolution.” When you buy music online, it’s usually compressed. iTunes sells music as 256-kbps AAC files, and Amazon offers MP3 files at around the same bit rate. If you compare these bit rates with the music on audio CDs, which is 1411 kbps, you can see there’s a big difference. Nevertheless, many people can’t hear the difference between CDs and most compressed files, though this can depend on a lot of factors. But you can get music files with resolution even higher than that of a CD, although there’s more to it than just bit rate. How does this translate into file size? As an example, a 9-minute and 25-second live recording from the band Phish weighs in at 18.4MB for a 256-kbps MP3 file, 67MB for a CD-quality FLAC file, and 126.2MB for a 24/96 FLAC file. The market for high-resolution audio files is clearly one for audiophiles but, while a niche within a niche, it is growing, and more and more labels and websites are selling files in these formats. Initially, classical music was the first genre to offer such files, as many classical labels were already recording in high-resolution for SACDs (super-audio CDs) and and DVD-Audio discs, and needed to simply convert their existing files to the appropriate formats. But the growth in this sector has led to many pop, rock, and jazz albums being released in these formats. For new recordings, this is easy, because they are now commonly recorded in 24/96 format. The files sold are often called “studio masters,” because they are the format that is used in the studio for the actual recording process. A number of websites now sell such files. Some of these are “stores” such as HDtracks (Rolling Stones, John Coltrane, Eric Clapton) or iTrax (San Francisco Symphony, Afro Cuban Latin Jazz Project), which sell a variety of albums from different labels. Others are record labels themselves, many of which are classical labels. Some of the most interesting to explore are Channel Classics, Gimell, Linn Records, and Da Capo, all of which are small, but provide high-resolution files. Other classical music stores, such as eclassical and The Classical Shop, offer a number of high-resolution files from the many labels they sell. The band Phish now sells its concerts in MP3, Apple Lossless, FLAC, and FLAC-HD (24/96) formats, and some people trading live recordings circulate them as 24/96 files as well. Some sites, such as Gimell Records, offer a variety of formats from MP3 to high-resolution surround-sound. Search the Web and you’ll find other labels and bands selling files in these formats. High-resolution files have a bit of the cachet of vinyl, but in the digital audiophile sector, so a lot of artists are jumping on this train. Macs can natively support up to 24/96, played through iTunes or other software. However, without a couple settings tweaks, audio files with resolution higher than 16-bit/44.1kHz will automatically be downsampled to that resolution. So the first thing you need to do is set your sound output to 24/96. To do so, open Audio MIDI Setup, found in /Applications/Utilities. Select the desired output on the left, and then change the settings in the Format section on the right to 96000.0 kHz and 2ch-24bit. Once you’ve made this change, you can play files at any resolution up to and including 24/96; lower-resolution files will actually be upsampled to 24/96 (which, unfortunately, won’t make them sound any better.) There is one caveat here: Some applications have trouble with audio above 16/44.1. If any applications you use don’t play audio correctly after making this change, you’ll need to switch back to 44100.0 kHz and 2ch-16bit—at least while using those programs. Change the Format settings in Audio MIDI Setup to 96000.0 kHz and 2ch-24bit. Also, running the music through your Mac’s built-in audio hardware means you’re probably not getting all the benefits of higher-resolution files. 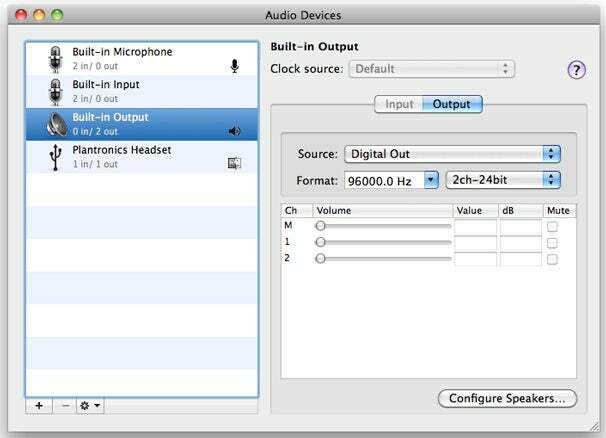 Ideally, you’ll want to use the Mac’s digital audio output to connect to an external DAC (digital-to-analog converter) that is, in turn, connected to a stereo. Some examples of DACs are the $429 Cambridge Audio DacMagic ( ), the $299 HeadRoom Micro DAC, and the $129 NuForce uDAC-2. You can also stream these files using a Logitech Squeezebox (such as the Touch [ ]) and some other streaming devices. Are high-res files worth it? High-resolution files cost more than regular downloads. 24/96 files can cost up to twice as much as MP3s or even CD-quality lossless files. To get the most out of them, you need to have good stereo equipment; if you want to go to the absolute best quality, 192kHz files, you’ll need a DAC hooked up to your Mac. In my listening, I found that some of the files sounded better than standard CD-quality files of the same music, but it’s hard to put a finger on why. In some cases, there was more depth, the music was more subtle, the soundstage a bit fuller, and the dynamic range broader. In other words, whether the bigger expense and larger files are worth it will depend a lot on your ears, your gear, and the types of music you listen to. The best way to tell is to try some of these hi-res files yourself and see what you think. Gimell Records has a couple of albums with samples available in your choice of format: “Victoria - Lamentations of Jeremiah” and “Josquin - Missa Malheur me bat & Missa Fortuna desperata”. This is Renaissance vocal music—maybe not everyone’s cup of tea—but a good litmus test for sound quality. Eclassical has two files in different bit rates you can sample, so you can compare them (scroll down to the bottom of the page). The Classical Shop has two samples available on a page listing its 24/96 downloads. Linn Records has a few test files, HDtracks offers a free sampler, and you can visit Channel Classics’ Try It Now page, where you can sample a new high-resolution track every week for free. As with music in general, a lot depends on the listener. If you feel these files sound better, and you have good enough stereo equipment, you may want to start shopping around for high-res files. If not, you’re better off sticking with CDs or downloads at the usual bit rates. Either way, just enjoy the music.